Since 1949, B.B. King and his legendary guitar "Lucille," have been belting, weeping, and strumming out heartfelt, mournful tune after tune of classic blues. A highly influential guitarist and musician, the celebrated, eighty five year old artist plays some his most beloved songs in 'B.B. King Live.' Though the music itself is great, a short running time and a slightly haphazard performing style, end up holding back the overall value of this live concert disc. The set list features eleven songs, including "Everyday I have the Blues," "Let the Good Times Roll," and "The Thrill is Gone." The show starts off by directly going into the first track, but King does take occasional breaks between songs (and sometimes during) to address and thank the audience, or bring out a variety of special guests. Though he stays seated for the duration, the musician's stage presence is still thankfully full of charm, charisma, and passion, allowing his playful personality to shine through. His performance of "Downhearted," is a great example of his fun sense of humor at work. Accompanied by a full band, King's guitar skills remains strong, even after all these years, and his vocals are as soulful as ever. From a visual standpoint, the performance is presented in a very basic, standard manner. Various angles of the musician, his band, and guests are cut to throughout, with some occasional looks at the audience as well. Some appropriately blue and purple hues cast the stage in a wash of deep, cool colors. The presentation doesn't exactly make for the most interesting or exciting experience, but the simple, functional setups let the audience see exactly what they need to see, with no added glitz or glamour. Throughout the show, King brings out a few special guest stars to accompany him on certain songs. Actor Terrence Howard is brought on stage for "I Need You So," and "I Got Some Help I Don't Need." The two play off each other well, but their banter back and forth can get awkward and seems to amuse themselves much more than the actual audience. Vocally, Howard holds his own, doing a fine enough job, but he doesn't really bring too much to the table. Singer Solange later joins King for a rendition of "The Thrill is Gone," and again, like Howard, she does good but not exceptional. King's playful sense of humor comes through again here, with some slightly uncomfortable but charming flirtation. The last of the special guests is guitarist Richie Sambora, who comes on stage for "Let the Good Times Roll," as well as another rendition of "The Thrill is Gone." Sambora plays well and brings a different energy to his style, which gels nicely with the music. All three guests then return together for a strong closing recital of "When the Saints Go Marching In." The concert as a whole, has a very improvisational feel to it. King almost seems like he's picking songs randomly as he goes, and while this does fit the traditional style of blues music and brings a nice, laid back quality to the proceedings, it also makes the show seem a bit rushed and slapped together. His work with his guests in particular, seems unplanned, even switching abruptly between songs with Sambora when one doesn't work out so well. Also, at only fifty four minutes, this is a relatively short program, which may leave some fans simply wanting more. 'B.B. King Live' is a decent, but slightly unfocused, hastily conceived, and all too brief effort from a legendary musician. Even so, the music is good, and despite his lack of mobility on stage, King knows how to connect well with an audience. Fans of the musician should be pleased, but this surely isn't the blues master at his best. Image brings 'B.B. 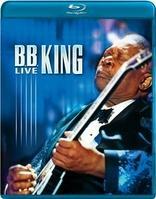 King Live' to Blu-ray on a single BD-25 disc. The movie comes housed in a standard case. After some logos and warnings, the disc transitions to a basic menu. The packaging indicates that the concert is region A, B, and C compatible. The concert is presented in a 1080i/AVC MPEG-4 transfer in the 1.78:1 aspect ratio. Shot digitally in high definition, the video looks decent but wholly unimpressive. The visuals are clean, though there are some minor video artifacts visible. Detail is rather average, and the picture has a very flat, electronic appearance. Colors are the one real bright spot, with the show's lighting design of cool hues looking nice on screen. Black levels are adequate and contrast is acceptable, but again the image has a lack of depth and genuine pop. 'B.B. King Live' looks OK, but the soft, flat video certainly won't be dropping any jaws. Still, the real focus here is on the audio, and the visuals get the job done with only minor technical flaws. The show is provided with a DTS-HD Master Audio 5.1 track and an uncompressed PCM 2.0 track. Both audio options sound nice, providing a solid listening experience. Vocals are crisp and full. Separation between the various musical elements is handled well, with each instrument coming through with fairly good fidelity and distinction. Rears are mostly reserved for crowd reactions, but the cheers and applause do offer some welcomed immersion. Dynamic range is satisfactory, and bass is deep, with the low end bringing some strong thud. The 2.0 track features similar audio, but lacks the added immersion of the 5.1 track. It may not rank among the top echelon of concert discs, but 'B.B. King Live' sounds pretty good, presenting the classic blues music in a pleasing manner. Bonus Song - Key to the Highway (HD, 7 min) - Presented in 1080i with DTS-HD Master Audio 5.1 and LPCM 2.0 sound, this is an additional performance from the concert, featuring King and Sambora playing "Key to the Highway." A nice enough bonus, this was probably originally cut for time when the concert was broadcast on television. Of some minor annoyance though, is the fact that the 5.1 mix abruptly cuts off with a few seconds left in the song. The 2.0 track doesn't exhibit this issue. 'B.B. King Live' is a basic concert disc, that unfortunately falls a bit short thanks to a brief running time and a hurried, unfocused approach. The video is average, but the audio presentation is solid. Supplements are very sparse, but the lone bonus song is a welcomed addition. Fans of King may want to check this out, but even they should be wary of the short length and lack of substantial bonus material.